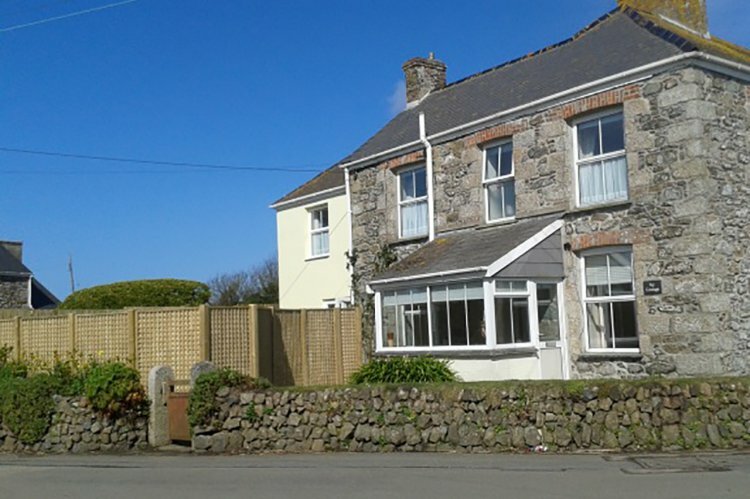 'Ivy Cottage' is a semi-detached, three bedroom property, with a shower room and family bathroom. It is just a short walk from the Lizard village green, with its popular eating pubs, restaurants, general stores and butchers. There is an enclosed garden and off-road parking for one car. Access to the coastal footpath and picturesque Church Cove are just a few hundred metres from the front door, with beaches nearby at Housel Bay and Kynance Cove. Good sea views from the upstairs bedrooms and the dual aspect master bedroom in particular. Enter from the front door into a large sunny porch with two cane armchairs and through into the lounge. Lounge has a bright dual aspect and stripped pine floor with hearth rug, Sony smart TV, DVD player and lovely feature open fire with logs supplied. Wifi is now available at this property. Kitchen has lots of storage, electric oven, 4-ring ceramic hob with extractor above, large fridge/freezer, dishwasher and microwave. Through to the dining room, with a large pine dining table and chairs. Through the French doors you can access the newly screened patio and garden area with a picnic bench. Also downstairs is the utility room with work surface, sink/drainer and washing machine, space for hanging coats and walking boots etc, door to garden. At the end of the upstairs hallway is the master bedroom and shower room (this may be separated by closing the hallway door to create an en-suite). Shower room, has power shower, toilet, his and hers matching sinks and mirrors, extractor, shaver socket and window with good sea views. The master bedroom has a king-size bed, bedside tables and lamps, wardrobe with drawer space and window seats. The dual aspect from this room has good sea views around the coast to Black Head, a fantastic view. The twin room has twin 3' beds, built-in wardrobe and shelving, bedside table and lamp and window to the front with good sea views. There is a single room with 3' single bed, built-in wardrobe with shelving, bedside table and lamp, and window to front with good sea views. The family bathroom has bath with mixer shower over and shower screen, matching suite, shaver socket, heated towel rail and extractor fan. Outside the enclosed garden has garden furniture, rotary line and automatic courtesy lighting. The property is completely double-glazed and centrally heated and it is an ideal house for all seasons. Bedlinen, electricity, wifi and central heating are included, as is a basket of logs. A stair gate can be provided. Please request this when booking. No smoking inside this property.